Facts about Inland Bearded Dragon. "Scientific name for the Inland bearded dragon is Pogona vitticeps". The Inland bearded dragon is also referred to as the Central bearded dragon. The Inland Bearded Dragon is a species of the agamid lizard that largely occur in a wide range of the semiarid to arid areas of the Australia. The Inland Bearded Dragon is quite popularly kept as pets and also exhibited in the zoos. The Inland bearded dragons are 13 to 24 inches (33 to 61 cm). They are yellow to tan in color. Like its bearded name affirm, the Inland Bearded Dragon has the ability to flare out skin in the throat region. Its body appears flat which gets even more pronounced when it is alarmed. The Inland Bearded Dragon has spines on the head, on the side of the body and on its throat. It has a wedged-shaped head, and its tail quite as long as the body. Inland Bearded Dragon is often difficult to distinguish the females from the males when they are still juveniles or hatchlings. The adult male Inland Bearded Dragon are quite distinct as they have larger heads, wider base tail, including large darker beards, the males also have femoral pores that will also help to tell them apart the from the females. Inland bearded dragons vary broadly in color; it ranges from grey, to red, to reddish-brown, to orange, to white, to also brown, a green one is yet to be seen. The Bearded Dragons are common in the arid deserts and woodlands of the central Australia. It generally spends quite most of its time in bushes and trees. Inland bearded dragons can also be found basking on top of rocks. On extremely hot day, the will burrow underground to keep cool. The inland bearded dragon live in a variety of habitats which include subrtropical woodlands, scrublands, savannas, shore areas, and deserts. As pets the Inland Bearded Dragon are kept in cages and secured with tightly-fitted lid, the sides of the cages are always smooth to avoid abrasions on its nose. You ought to know that wire cages can not retain heat and can also result in foot and nose trauma. One can also use an aquarium to house the Inland Bearded Dragon and an adult requires up to a minimum of 55 gallon (200 liters) aquarium. As earlier stated, the Inland Bearded Dragon has a way to puff out its beard mostly when threatened or when it is being territorial during breeding. Both the male and the female have this habit and to appear even fiercer, the Inland Bearded Dragon gapes or opens the mouths widely. When it is showing submission, it holds up one of its front legs as it slowly waves it. 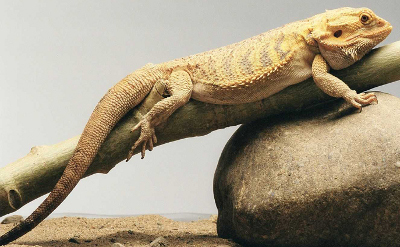 The Inland bearded dragon is docile and mellow, even if it is in its wild habitat. Though at times the juveniles and hatchlings are skittish, the adults show that they do enjoy the human companies more, which makes them a good pair. When the Inland Bearded Dragon are under direct attack, they open their mouths so widely to expose the yellow membranes, it may also darken its skin color and flatten its body then hiss while making small jumps towards its attack. In the wild the Inland Bearded Dragon are known to be opportunistic omnivores; they will eat plant matter, spiders, insects, and occasionally they also eat small lizards or rodents. In the zoo, the Inland bearded dragon is fed crickets and salad a few times a week. In the wild the Inland bearded dragons can live 4 to 10 years. In captivity they can live up to 10 years. Inland bearded dragons reach sexual maturity at 1 to 2 years of age. They breed during the summer months in Australia which is September through March. Females dig a burrow to lay up to 9 clutches per year. Each clutch can contain up to 24 eggs. Incubation of the eggs last 50 to 70 day and are not attended to by the Inland bearded dragons. The hatchlings are 3 to 4 inches (7.5 to 10 cm) when born.